Nowadays, social media plays a huge part in any successful business. Facebook, Instagram and Twitter continue to attract attention, so it’s time to think about using them to improve your hotel’s visibility. That said, we know it’s not as easy as it looks. It takes time to think of great content and keep your profiles up-to-date. And it’s also hard to know what success looks like. We’ve picked a couple of Inn Style users who are acing the social media game. Take a look at their profiles below for some inspiration. Their Instagram page is clean and simple – natural, outdoorsy photos interspersed with cosy cabin snaps. The amazing pictures of the forest, sunsets and snow generate a buzz about the surroundings too, not just the properties themselves. 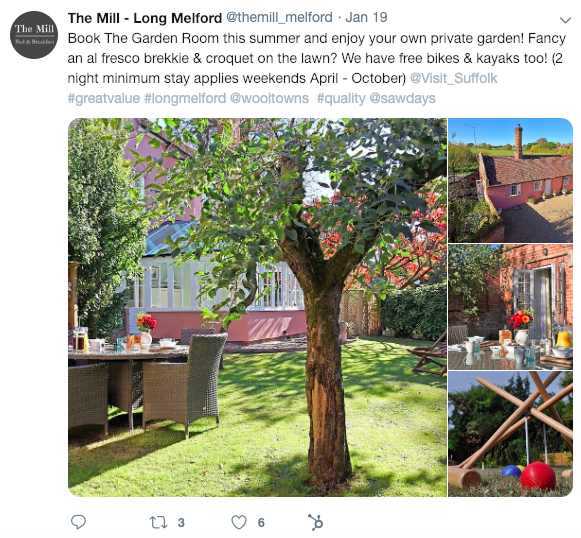 Their targeted hashtags also make it easier to be found by people who are looking for a holiday in a countryside cabin. People can search for specific hashtags on Facebook, Twitter, Instagram, and Pinterest. 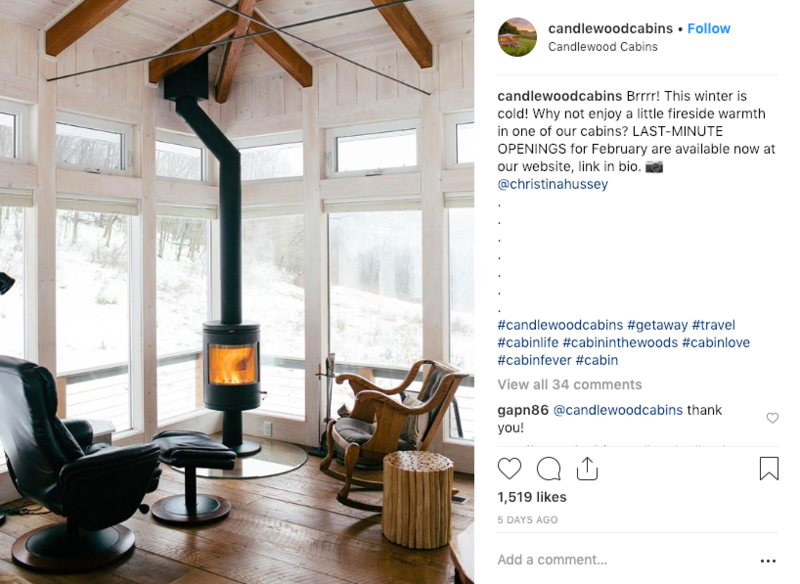 So, if someone is searching for a #cabininthewoods, your property is more likely to be found if you use this hashtag in your post. You can play around with hashtags too – so have a Google of the most popular ones, and see if you can incorporate them into your social media posts. As well as great photos, Fforest also use Instagram to promote upcoming events and things to do at their accommodation. Follow their lead and do the same at your place! Do you sell great homemade jam? Do you have an awesome deal with a local restaurant or spa? Spread the word on social – and don’t forget to use those hashtags! As well as posting regular content with hashtags, it’s also a good idea to link your social pages to your website. If a guest enjoyed their stay, ask them to follow you on Instagram, Twitter or Facebook. That way they’re more likely to see when you post about last-minute availability or great promotional rates. Facebook is useful. Not only can you reach a huge audience, but you can also collate some really awesome information about your property: everything from photos and videos, to reviews, to adverts. 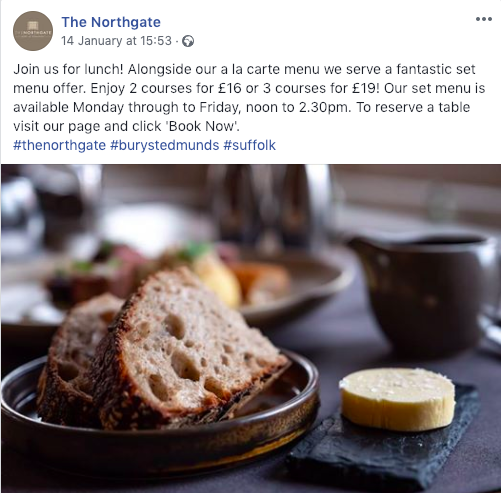 The Northgate use Facebook to share new menus, promote local events, and highlight last-minute availability. They also encourage guests to leave post-stay reviews. These are visible to everyone, making them a great validation point for a potential booker. Not only that, but they’ve also added a Book Now button to their Facebook page – so if guests are serious about booking, they can do so quickly and easily. This article explains how to create a Book Now button. The Mill have a great Twitter account – a healthy balance of photos, property updates, and fun anecdotes. They’re also active retweeters (retweeting = reposting something from another account). This shows their support for local businesses and other Twitter users. They’re also good at replying directly to comments, and liking other relevant content. This means more people are likely to stumble across their account and have a look. Hashtags are great on Twitter too, but limit them to one or two. Top tip: Don't forget to add your website to your Twitter bio. Hopefully these accounts provide you with a little inspiration to set up your own. Once you've done so, don't forget to like Inn Style on Twitter, Facebook and Instagram. We promise we'll return the favour.